At the end of 2012 Michles & Booth wanted to do a few things. They needed to increase their digital marketing efforts for their 3 office locations around Pensacola, and needed a new and fresh website design. They had seen some results from past SEO efforts but felt they should be getting much more out of it. Because they wanted more traffic and an increased reach via digital marketing we build a “Digital Marketing Blueprint”. The blueprint dictated the site structure (internal linking and pages needed) of the website and how much content would be needed to increase and control market reach. Once the blueprint was completed our design team worked with M&B to generate layouts that achieved a few different goals. 1. To give the Firm a FRESH and Professional look. 2. To add a SILOed Site Structure. Giving them more reach with less content. 3. 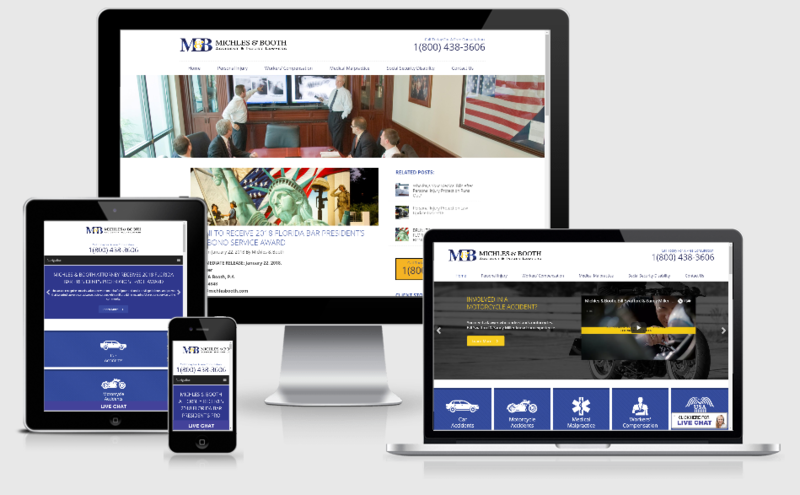 Achieve a better user experience as people visit the website. With a SILOed website we implemented the Clay Digital Content Casting process for blogging. This gives more reach and turns the blog into more of a radio station broadcasting the content across the internet and increasing the reach. In 2018 M&B Launched a new office on the other side of the state, and we are rolling out the marketing for that office. The firm was excited with the new design in 2012 and even more excited with the redesign in 2018. The Content casting combined with a SILOed site architecture has increased traffic and reach by 1200% of monthly traffic on average. They continue to be monthly clients.